Maureen: We’re having sausages for dinner! Andrew (16) and Nicholas (12): Yeah! Tim: Well, I’m happy about it. Maureen: I know you are. I am too. I’m a fan of lentils. Tim: Really? I don’t think that was always the case. Maureen: Maybe not, but I like them now. What do you think? Andrew: I like the sausages. I don’t like the lentils. Nicholas: Ditto. And I think the green stuff on top [Editor’s Note: A type of rocket pesto], makes it even worse. Tim: You guys need to be more adventurous. 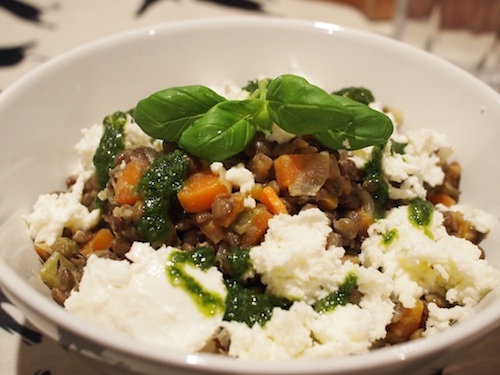 Lentils are good, and good for you. This is good. Maureen: Maybe it’s for the best that I didn’t make the tradition New Year Good Luck Lentils on New Year’s Day. 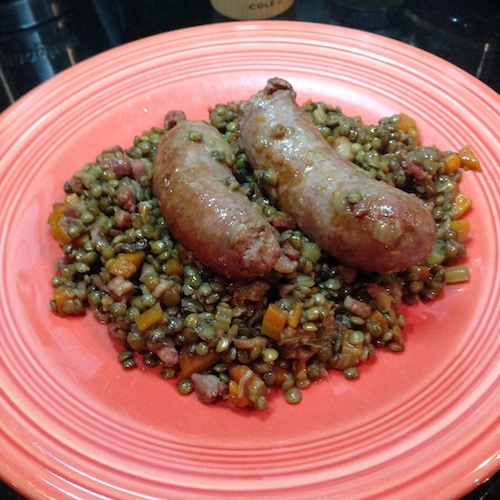 If the rest of your family does like lentils, I recommend you try this. It’s a great midweek recipe: easy and fast. Click through this paragraph to see the original recipe in the Guardian. Disaster! I forgot to take a picture of this! Sorry, loyal readers. Suffice it to say, it’s not that photogenic a dish anyway, but it is very tasty. Maureen: Ottolenghi calls this the ultimate comfort food. Do you agree? Andrew (14): What’s it called? Maureen: To be honest, I have no earthly idea how to pronounce it. But it’s spelled m-e-j-a-d-r-a. We could just call it the lentil-rice-fried onion dish. Maureen: Good interesting or bad interesting? Nicholas: I think it’s good interesting, but I’m not 100 percent sure. Maureen: I think it’s delicious, and given this is the third or fourth time we’ve had it, I think we can call it a success. Tim: Was it difficult to make? Maureen: To be honest, Kirstin and Anna don’t call him “Faff-Olonghi” for nothing. This was definitely a bit of a faff, which you don’t really figure out until you’re halfway through making it. I had to fry the onions in batches, which took way longer than I thought it would, in addition to making the lentils and the rice. Tim: Yes. I remember that was the case the last time I made it. Maureen: Despite that, though, this is delicious and a good thing for Meat Free Monday. I also know from experience that it’s excellent leftover, too. Another win from Jerusalem. To make this yourself, find the recipe on the Guardian website by clicking through this sentence. Maureen: I made this one especially for Dad. Maureen: Because Dad LOVES lentils. He is its number one fan. Nicholas (10): I can’t say I agree with him. Tim: Why don’t you agree with me? Nicholas: Don’t you remember that time we had lentils on New Year’s Day? Tim: Yes. We try to do that every year. It’s supposed to bring us good luck for the year. Nicholas: Yes, well, I didn’t like them then, and I don’t like them now. Maureen: But then you’ll NEVER have good luck for the year! Nicholas: I don’t care. I don’t like them. Never have, never will. Maureen: OK. How about everybody else? Andrew: Meh. I like the sausages. I like the lentils, but I don’t love them. Tim: I love it all, but especially the lentils. Maureen: Which is exactly why this is dinner tonight. Anna: Words cannot express how little I want to eat this. I feel like I’ve just fought a war with every pan and ingredient in the kitchen, and lost. Ernie: Wow, this looks incredible. Do you eat like this every night? Anna: Can I just point out that someone clearly didn’t proof read this book. Jamie says to ‘halve the chilli’. That’s it. Halve it. So I did. And put it in the frying pan. Sceptically. And five minutes later I had to pull the thing out of the frying pan to chop it up because really, that’s what you are supposed to do. Even though he DOESN’T SAY SO IN THE RECIPE. And. And. He calls for a small frying pan. What he means is a medium frying pan. You can’t get a whole packet of lentils in a small frying pan with spring onions and half a chilli and a squashed tomato. So I had to transfer everything halfway through cooking. And part of that bloody tomato went on the floor and my cashmere cardigan when I squashed it. What’s wrong with chopping eh Jamie? Peter: Please excuse her. She’s having a rant. Ernie: Well I think it tastes delicious. It is really different. It’s spicy and sweet. Very different. Anna: I’m glad you like it Dad. But I’m never cooking it again. 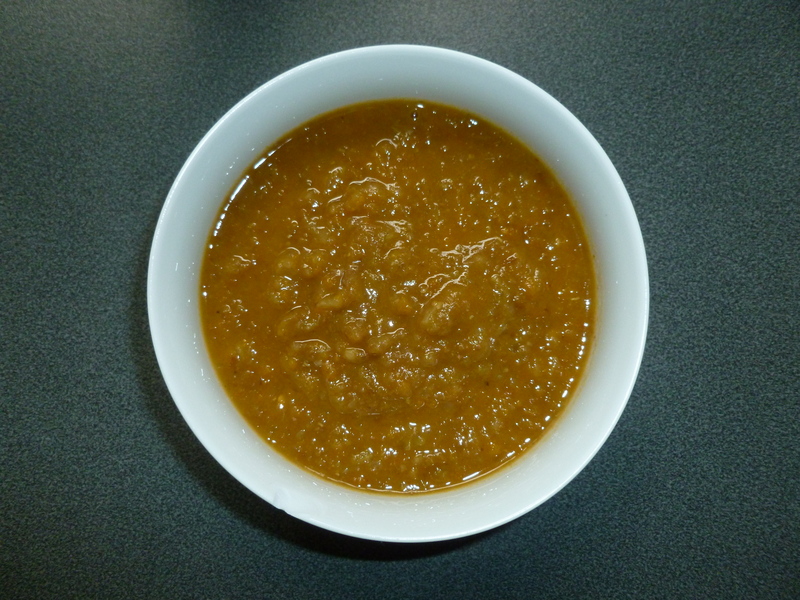 Anna: As the name suggests, this is described as a very quick soup to make. Anna: Well I managed to rustle it up in the last 10 minutes of Louis’s nap time so yes, I’d say this is a fair descriptor. I’m not sure I’m overly thrilled with it though. Peter: I think it’s nice. It’s not as worthy as some lentil soups can be. It has a nice sweetness to it. Anna: I just don’t think it’s filling enough. You expect lentil soup to be filling. The minestrone was a much more satisfying bowl of soup. I expect it’s because there isn’t enough lentils. One tin for a recipe that serves 4 doesn’t seem enough to me. Peter: So does speed triumph over satisfaction? Anna: In soup, as generally in life, no. 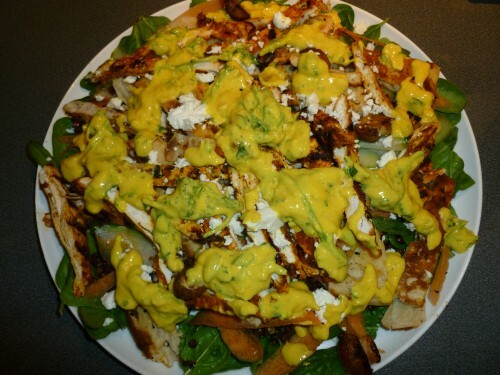 If you’d like to try this salad yourself, Google Books has reproduced it here. Maureen: Something for you, Tim. 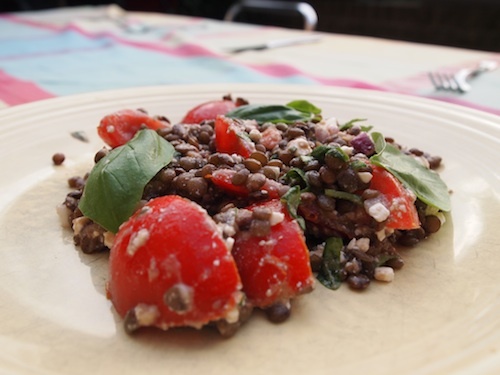 A lentil salad! You love lentils. Maureen: There’s something for me in this too. Feta cheese! Hooray. This wouldn’t be good for vegans, though. What do you think? Tim: I thought this was good, but I’d like this dish more hot than cold. Maureen: I know what you mean. The recipe says that this is best served at room temperature, but I disagree. I think it would be much better with lentils hot and straight out of the pan. Tim: I don’t think this really works at room temperature, I have to say. Maureen: Agreed. This is good, but would be even better warm. Room temperature doesn’t really work, unfortunately.